What is “Frog Princess” mobile slot about? Frog Princess is an online video slot machine powered by iGaming2Go. This video slot has five reels and three rows. There are 100 paylines, helping players raise the ordinary bets, but the mobile version of the slot supports only 20 of them. The bet ranges from 1 to 30 points per line and the maximum bet is 2,000 credits. There is no progressive jackpot. The player can try their luck online, as there is no downloadable version available. This slot is a highly promising game, with a 98% pay-out percentage. Frog Princess is a fantasy themed game inspired by the popularity of The Frog Prince slot, which is also based on a popular fairy tale. The slot game uses bright and flashy colours, coupled with decent sounds. But these catchy colours do not distract players, making the game pleasant and easy on the eyes. The dominant colours of the slot are green and blue. The icons in the game are themed around animals and the forest. The player will meet frogs, mushroom, crystal ball, snail, fish, magic book, lily pad and pink flowers. However, this video slot does not feature any cards (10, J, Q, K, A) as symbols, unlike most slot games. The minimum bet that can be placed to play The Frog Princess is one cent and the maximum bet is 2,000 credits. In the free mobile version, one credit is equal to €0.01 in the real money game. The bet ranges up to 30 coins per line. The wild symbol of the game is the princess. It looks like a female frog, wearing a crown on its head. It can substitute for any symbol in the game, increasing significantly the winning. When the player gets a winning combination, special animated effects are activated. 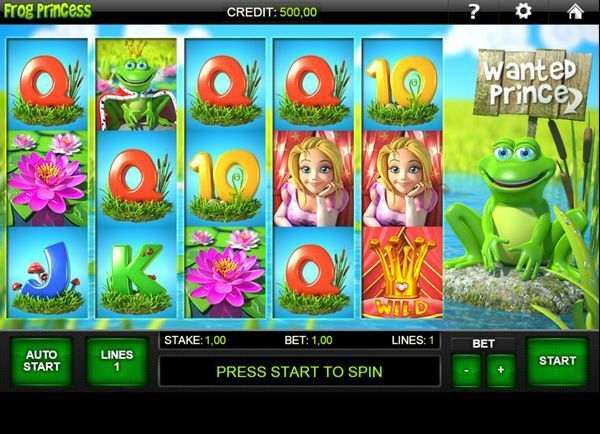 The Frog Princess features multipliers and free spins, which increase the winnings, even making them double. When the player gets three princess symbols on the reel number three, the bonus game called Princess Gone Wild is activated. At that time the screen is cleared, and the player has the possibility to choose one princess from a selection of ten. Each symbol hides behind a number of free spins the player wins, or the worth of the multipliers. The player can win up to twenty free spins while playing the bonus game and the pay-outs will be counted in the overall winnings. The bonus feature can be re-triggered. The scatter symbol of this slot is the golden ball. When it appears three or more times on the reels, the scatter game is activated. If three scatters appear from left to right, the player gets 10 free spins. Every win will trigger the gamble feature. This feature gives players the possibility to double all their earnings, or to lose everything. If the blue symbol appears in the gamble round, the player will be protected from any loss of the winnings. Kiss me, and you will be rich!